70th Music for 1949. 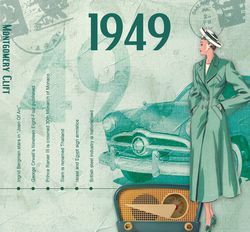 The twenty 1949 songs found on this CD/Card combo will bring any party to life and get people talking about the time and music of the year! The 70th birthday music that is on this CD include many of the 1949 top hits: 20 Hits Of 1949 - The Classic Years 1. Duke Ellington - Don't Get Around Much Anymore. 2. Doris Day - Again. 3. Tommy Dorsey - Summertime. 4. Frank Sinatra - I Only Have Eyes For You. 5. Dizzy Gillespie - You Go To My Head. 6. The Metronome All-Stars - Overtime. 7. Django Reinhardt - It's Only A Paper Moon. 8. Floyd Tillman - Slipping Around. 9. Mario Lanza - They Didn't Believe Me. 10. Sarah Vaughan - Black Coffee. 11. Count Basie - Shoutin' Blues. 12. Charlie Parker - Victory Ball. 13. Frankie Carle & His Orchestra - Cruisin' Down The River. 14. The Stanley Brothers - Fields Have Turned Brown. 15. Tony Martin - There's No Tomorrow. 16. Molly O'Day - Poor Ellen Smith. 17. Little Jimmy Dickens - Country Boy. 18. Tommy Dorsey - I'm In The Mood For Love. 19. Dinah Shore - Dear Hearts & Gentle People. 20. Dizzy Gillespie - St. Louis Blues.